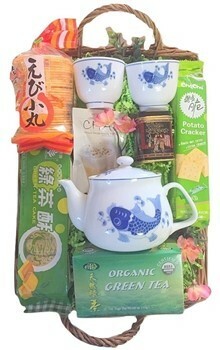 The wicker tray includes Green Tea cookies, Green Tea pack, 4 Jasmine tea's single serve,( or alternative) Savory Rye or Cha Cha crackers, Shrimp rice crackers, Chinese teapot and matching Chinese cups (style may vary). Elegant ribbon and Orchid bloom. Prices in Canadian Dollars. Tax and Shipping are Included. Delivery via UPS Ground asap. 3-7 days.